Visit my website to learn more about Lori Saxion's legal practice. 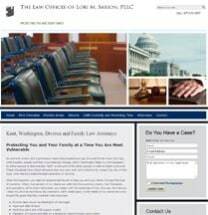 The Law Offices of Lori. M Saxion, PLLC, can represent you in many areas of family law. Visit my practice areas page to learn how her experience can be put to work for you. I work with my clients to determine their goals and expectations, working diligently to make sure they have the best possible outcome from their divorce. I will work with you to create a custody and parenting plan that will fit your lifestyle and help you contribute to the lives of your children. Read my biography to learn more about my experience and practice.